Empire Is a Massive Hit. Here’s What Its Success Could Mean for the TV Business. The rise of Fox’s Empire has been swift and stunning: Following an unexpectedly high-rated debut three weeks ago, the music-driven soap opera from Lee Daniels has managed the exceedingly rare feat of adding audience in each of its subsequent airings. It’s passed ABC’s How to Get Away With Murder as TV’s No. 1 new show this season among viewers under 50. And while the series is reaching millions of viewers of both genders and all ethnic groups, Empire is a bona-fide phenomenon in African-American households: Nielsen reports that last week’s episode was seen in a jaw-dropping 33 percent of all black homes — or five times as many as the No. 2 scripted broadcast show last week, NCIS: Los Angeles. History and gravity suggest Empire will cool down a little, perhaps as soon as tonight’s installment. But even it does, it will still rank as one of the most successful series launches in the past couple years, and serve as a much-needed ego boost to a broadcast-TV industry continually being written off as extinct. The question now: Will Empire have an impact beyond its 9 p.m. Wednesday time slot — both for Fox and for the TV business in general? What sets the show apart from successes such as Murder, Gotham, Blacklist, and Scorpion is that it began big (a 3.8 rating among adults under 50), went up in week two (to a 4.0), and then ticked up again with its third broadcast (4.4). A few lower-rated shows that started in weak time slots or didn’t get much buzz early on have likely improved in the ratings early in their runs. But Fox’s research department says it’s been at least 20 years since any top-rated drama grew among adults under 50 in its first three weeks on the air; among all viewers, it’s been ten years since Grey’s Anatomy ticked up each of its first four broadcasts back in 2005. Because so many viewers are now used to time-shifting shows once they check them out the first time, TV-industry insiders were fairly confident Empire would decline in week two. The fact that it didn’t, and then grew yet again, has even rival network execs giddy. “Whatever competition this is for us, it’s still good for broadcast TV,” one competitor told Vulture. Fox TV Group’s chief operating officer Joe Earley says he “didn’t believe the early [overnight] ratings” for the show at first. “We really are focused on the L3 [DVR] numbers now,” he says. So when the same-day ratings came in on Thursday, and other execs at the network were emailing him about the strong early ratings, “I kept replying, ‘Let’s not get ahead of ourselves,’” Earley explains. “When the lift was there in the L3, it was incredible.” Bottom line: Fox’s ability not only to bring viewers to a new show (as other nets have done, too), but then to keep building that audience (the way cable networks do on a regular basis), bolsters broadcasters’ argument that they’ve not become totally irrelevant in the ever-expanding TV universe. Another impressive aspect to Empire’s early success is its ability to reach large numbers of viewers while also overperforming in certain demographic groups. Last week’s episode, for example, will end up reaching over 15 million viewers once a week’s worth of DVR data is tallied, putting it among the top ten most-watched shows on broadcast TV this season. But that same episode also did very well with younger viewers: Among adults under 35, it notched a 3.6 rating (before DVR tallies), doing nearly as well as the combined same-day averages of Wednesday rivals Law & Order: SVU (0.9), Criminal Minds (1.0), Chicago P.D. (1.0), and Stalker (0.8). Women are certainly helping to drive tune-in for Empire, with ratings among female audiences about two times the size of the male viewership. But that’s actually not a huge gap, at least relative to many other hits. NBC’s Wednesday dramas (and its hit reality show The Voice) also perform about twice as well with women versus men, while ABC’s The Bachelor attracts three female viewers for every one dude. 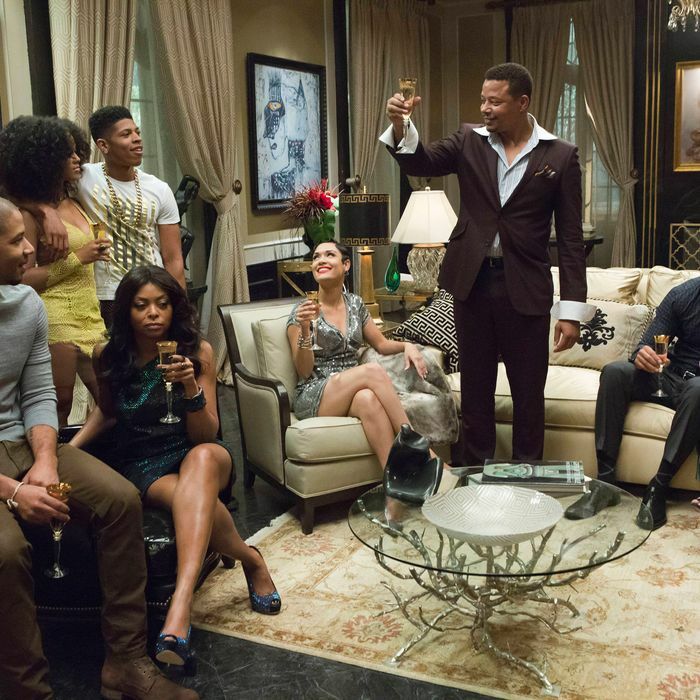 As for the ethnic makeup of Empire, the show’s majority-minority cast has paid off in a big way. Last week’s episode was by far the No. 1 English-language show on broadcast TV in homes with African-American and Hispanic heads of household — and by a huge margin. Among Hispanics, Empire outrated its nearest scripted broadcast rival (Fox’s Backstrom) by a 2-1 margin. And in addition to making it into one out of every three black homes, as noted above, among African-American women between 35 and 49, the show is literally the equivalent of a Super Bowl. Last Wednesday’s episode scored a 40.6 rating and 76 share in that group (including three days of DVR replays) — a number exceeding the rating of some NFL championship games this century. Empire debuted to a huge same-day number, but Fox execs went into the show’s launch with no expectations of such a massive debut. Instead, they planned on having to recruit audiences to check out the series after it aired on TV, by watching a DVR recording via on-demand platforms. The network made sure audiences could watch via VOD just hours after the show debuted on Fox (rather than waiting a few days, as often is the case with broadcast VOD), and it ran ads encouraging such nonlinear viewing. The fact that so many people had already watched Empire the night it aired — and took to social media to express their approval of the show — made Fox’s job just a bit easier. “I think positive word-of-mouth drove the catch-up,” Earley says. “That’s why we did such an aggressive catch-up messaging plan. We had planned it all along — knowing if people watched, they’d love it — and when it premiered so strongly, we increased the messaging to capitalize on the buzz.” It worked: Viewership for the premiere episode of Empire jumped from just under 10 million viewers to over 14 million once time-shifting was tallied. And Comcast, the nation’s largest cable operator, said the premiere was the most-requested title on its Xfinity VOD platform, with the show viewed in nearly one million Comcast homes within a week of its broadcast debut. That’s a one-week record for the Xfinity VOD platform, and 10 percent better than the previous record holder, American Horror Story. Overall, Fox says an additional 3.2 million people saw the debut via various nonlinear platforms (including Hulu and the Fox Now app). The fast start for Empire couldn’t have come at a better time for Fox. After riding the American Idol wave for a decade, the network’s Nielsen numbers came crashing down, particularly last fall. Though Gotham debuted well in September and has maintained its momentum, other Fox newcomers such as Red Band Society, Mulaney, Utopia, and Gracepoint were total duds, while the network’s Tuesday comedies survive largely on a diet of critical raves and a few million loyal fans. Fox Entertainment chiefs Dana Walden and Gary Newman, brought in last summer to replace nudged-out former boss Kevin Reilly, had been preparing to settle in for a years-long rebuilding effort, not unlike that faced by NBC chief Robert Greenblatt following the end of the Jeff Zucker era. But Empire has instantly transformed the narrative at Fox. Yes, it’s only one show on one night, but its halo effect seems to also be lifting Idol a little bit, its decline having slowed this season. It’s also a lot harder for entertainment-industry journalists analyzing the network ratings race to describe Fox as “struggling” and “beleaguered” when it’s likely to end the season with a solid new hit on Monday (Gotham) and one of the year’s biggest hits overall. Most important, Empire buys Newman and Walden time: They’re still under pressure to find new hits for Fox (especially on the comedy side), but not nearly as much as they were even just a few weeks ago. Assuming Empire stays strong in the ratings, its influence will almost certainly be felt outside the walls of Fox. It’s too late in network TV’s development cycle for it to result in a slew of musical soap operas suddenly being green-lit. Longer-term, however, its success can’t help but encourage NBC’s Greenblatt and ABC chief Paul Lee to redouble their efforts to find their own musical hits (if only to atone for their respective failures with Smash and Galavant). More over-the-top soaps also seem likely, though if that happens, it won’t just be Empire that deserves credit (or blame). After all, Empire is in many ways Fox’s attempt to capitalize on the smashing success of Shonda Rhimes’s Scandal and How to Get Away With Murder, both in style and in taking a diverse approach to casting. It’s on that front — opening up more roles to actors of color — that Empire might have its most immediate impact. Pilot-casting season is just now underway, with the broadcast networks all scurrying to place hundreds of actors into their new projects. This season’s two biggest drama hits (Empire and Murder) and the only new comedy success (black-ish) all feature nonwhite actors in leading roles. It’s hard to see how this fact doesn’t further push execs and producers to diversify their casts. After all, nothing changes behavior in Hollywood faster than the prospect of a big hit.